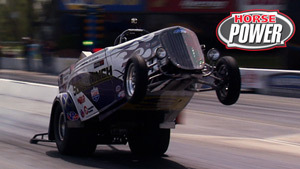 (JOE)>> HEY LETS FACE IT, HEADS UP DRAG RACING'S COOL, BUT IT TAKES DEEP POCKETS TO BE A SERIOUS COMPETITOR, EVEN DEEPER POCKETS WHEN YOU BREAK A LOT OF PARTS. THAT'S WHY FOR WEEKEND COMPETITORS BRACKET RACING IS STILL THE MOST POPULAR CLASS AT THE DRAG STRIP. 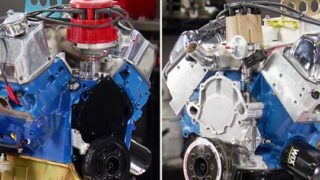 SO TODAY ON HORSEPOWER WE'RE GONNA TAKE A BUNCH OF REPURPOSED PARTS, A FEW NEW ONES, AND A WHOLE LOT OF MESSAGING AND BUILD A BUDGET BRACKET RACE ENGINE THAT MAKES PLENTY OF COMPETITIVE CONSISTENT POWER. 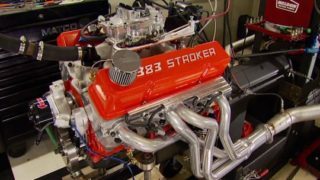 NOW WHEN BUILDING A RACE ENGINE, ESPECIALLY THE PARTS ARE IMPORTANT, BUT IT'S THE WAY YOU PREP THEM AND CLEARANCE THEM THAT REALLY COUNTS. OF COURSE SINCE CHEVY MADE OVER 90 MILLION OF THESE CHEVY SMALL BLOCKS SINCE 1955, THIS WAS A NO BRAINER FOR OUR BASE. IT'S BEEN CLEARANCED FOR A STROKER CRANK BORED 30 OVER. THEN JOHN LINE HONED THE FOUR BOLT MAINS BECAUSE WE REPLACED THE BOLTS FOR STUDS. THE FREEZE AND OIL GALLEY PLUGS ARE ALL NEW AS WELL. (JOHN)>> I ALSO MILLED THIS BLOCK WHILE I WAS AT THE MACHINE SHOP, AND I DID THAT FOR A COUPLE OF REASONS. ONE WAS TO INSURE FLATNESS AND SQUARENESS FROM TOP TO BOTTOM, FRONT TO BACK. ANOTHER ONE WAS TO MAKE SURE THAT I HAD A NICE SMOOTH SURFACE FOR MY HEAD GASKET SEAL AS WELL AS SETTING MY PISTONS FIVE THOUSANDTHS IN THE HOLE. NOW I ALSO UPGRADED FROM THE STOCK TYPE CAM BEARING TO A TEFLON COATED FROM DURABOND AND HERE'S WHY. WE'RE UPGRADING THE CAM SHAFT TO THIS. IT'S A HYDRAULIC ROLLER DESIGN FROM COMP CAMS THAT NOT ONLY SOUNDS GREAT, BUT SHOULD GIVE US THE GAINS WE'RE LOOKING FOR IN MID TO HIGH RPM RANGES WITHOUT SACRIFICING OUR BOTTOM END. IT HAS A GROSS LIFT OF 533 ON THE INTAKE SIDE AND 519 ON THE EXHAUST WITH A ONEFIVE RATIO ROCKER ARM. 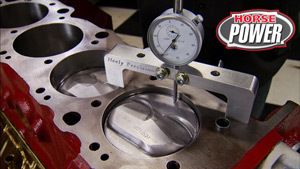 THE DURATION MEASURES OUT AT 243 ON THE INTAKE SIDE AND 257 ON THE EXHAUST SIDE AT 50 THOUSANDTHS VALVE LIFT. I LIKE TO PUT ON THE CAM GEARS NOW AND MOVE IT TO THE INSTALL POSITION. I'LL SHOW YOU WHY HERE IN A MINUTE. THE NEXT STEP IS TO INSTALL OUR MAIN BEARINGS. THEY'RE A THREE QUARTER GROOVE HIGH PERFORMANCE BEARING FROM KING. NOW EVEN THOUGH I LINE HONED THE BLOCK, THERE CAN BE A SMALL VARIANCE IN SIZE BETWEEN BEARING THICKNESS AS WELL AS CRANK JOURNALS FROM WHEN IT WAS GROUND. SO SOME TIMES THERE'S A SLIGHT DIFFERENCE IN CLEARANCE BETWEEN JOURNALS. IT'S NOT A BIG DEAL, ALL YOU HAVE TO DO IS KNOW HOW TO CORRECT IT. WITHOUT THE CRANK SHAFT, ALL THE CAPS AND BEARINGS NEED TO BE IN PLACE AND TORQUED TO SPEC. THEN ONE BY ONE GET A READY OF YOUR INSIDE BEARING DIAMETER AND WRITE THEM DOWN. NOW MIC YOUR CRANK SHAFT AND GET THE OUTSIDE DIAMETER OF EACH JOURNAL AND WRITE THOSE DOWN AS WELL. OKAY, LET'S TAKE A LOOK AT OUR MAIN BEARING CLEARANCES. WE'RE SHOOTING FOR BETWEEN TWO AND THREE THOUSANDTHS. NUMBER TWO AND THREE ARE SET AT TWOFOUR, SPOT ON. NOW NUMBER ONE'S A LITTLE ON THE SMALL SIDE AT TWO THOUSANDTHS EVEN. NUMBER FOUR'S A LITTLE ON THE BIG SIDE AT TWOSEVEN. NOW HERE'S HOW WE'RE GONNA CORRECT THAT. WE'RE GONNA TAKE BEARING FROM NUMBER ONE, SWAP IT WITH BEARING NUMBER FOUR. NOW PUT THOSE CAPS BACK IN PLACE AND TORQUE THEM AGAIN, AND GET YOUR NEW READING. NOW BY JUST SIMPLY FINDING THE DIFFERENCE BETWEEN THE TWO SIZES, WE'VE GONE FROM TWO THOUSANDTHS TO TWOTHREE ON BEARING NUMBER ONE, AND TWOSEVEN DOWN TO TWOFOUR ON BEARING NUMBER FOUR. WE'RE NOT GONNA GET ANY BETTER THAN THAT. WE'RE GONNA PREP THE BEARINGS NEXT, AND WE'RE USING TORQUE ROLL ASSEMBLY LUBE THAT WE GOT FROM EDELBROCK THROUGHOUT THIS BUILD, WHICH BRINGS US TO OUR CRANK SHAFT. NOW IT'S A REPURPOSED PIECE WE'VE REUSED TO TRY TO SAVE MONEY, WHICH IS FINE BY ME. 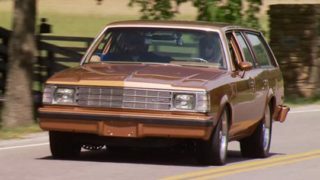 IT'S A STROKER CRANK FROM EAGLE. IT EVEN STATES STANDARDS ON THE MAINS AND RODS. NOW BY NOT BUYING A NEW ONE OR REGRINDING THIS ONE, WE WERE ABLE TO AFFORD THE BALANCE. AND TO KEEP IT ALL TOGETHER, WE USED ARP STUDS WITH SOME OF THEIR ULTRA TORQUE ASSEMBLY LUBE. NOW HERE'S SOMETHING YOU CAN DO AT THE HOUSE FOR FREE AND MAKE A BIG IMPROVEMENT IN OIL FLOW. NOW THIS IS WHERE THE OIL PUMP FEEDS THE ENGINE AND THIS WALL CAN BE A BIG RESTRICTIVE. SO WE'RE GONNA FIX THAT. NOW YOU'LL NEVER NOTICE THE EFFECTS FROM THIS, BUT IN THE WORLD OF RACING, EVERY SMALL IMPROVEMENT CAN EQUAL BIG RESULTS. SINCE THIS REAR MAIN IS ALSO THE THRUST BEARING, I WON'T TORQUE IT DOWN YET, BUT I WILL TORQUE ONE THROUGH FOUR. THEN APPLY FORWARD PRESSURE TO THE CRANK SHAFT. NOW TORQUE THE REAR MAIN. THIS WILL LOCK THE CRANK SHAFT IN PLACE, BUT YOU SHOULD ALWAYS CHECK YOUR END PLAY, WHICH NEEDS TO BE BETWEEN FIVE AND 10 THOUSANDTHS. I'M HAPPY WITH LUCKY NUMBER SEVEN. NOW MINUS MACHINE WORK, THE ONLY NEW MONEY WE'VE GOT IN THIS BLOCK RIGHT NOW IS IN CAM SHAFT, BEARINGS, AND STUDS. LETS HOPE OUR LUCK HOLDS OUT FOR THE REST OF THIS PROJECT. 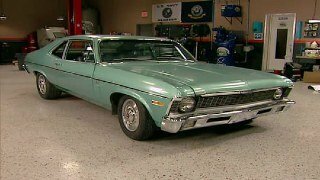 (JOHN)>> WE'RE BACK ON OUR BUDGET BRACKET MOTOR, AND SO FAR ALL I'VE GOT IN IS MY CRANK AND CAM SHAFT. YOU CAN'T RUSH PERFECTION. NOW WE'RE READY FOR OUR TIMING SET. NOW THIS ONE YOU MIGHT NOT BE THAT FAMILIAR WITH, IT'S EVEN A FIRST FOR ME. 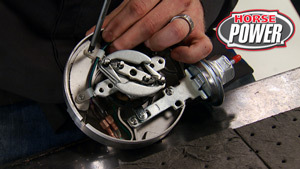 NOW THIS WAS COMP CAM'S WET BELT DRIVE SYSTEM. 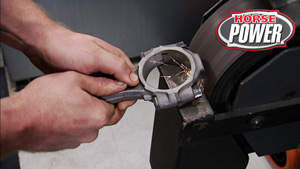 IT'S DESIGNED TO GO BEHIND THE TIMING CHAIN COVER FOR RACERS WHO DON'T WANT IT OUTSIDE THEIR BLOCK. NOW THE CAM GEAR'S BILLET ALUMINUM, THE CRANK IS STEEL, AND THE BELT THEY SAY IS STRONGER AND MORE RELIABLE THAN A CHAIN. WITH A LITTLE LOCTITE ANTISEIZE, IT'S A PRESS FIT NOT HAMMER FIT INTO PLACE. REMEMBER WHEN I CLOCKED THE CAM RIGHT AFTER THE INSTALL, HERE'S WHY. WHEN YOU SET THE CRANK PULLEY CORRECTLY, THE REST IS PREALIGNED. THIS WILL SAVE A LOT OF HASSLE WHEN INSTALLING THE TIMING CHAIN. NOW WE CAN'T DEGREE OUR CAM SHAFT UNTIL WE GET OUR NUMBER ONE PISTON AND ROD ASSEMBLY TOGETHER AND IN THE MOTOR. NOW WE'RE REUSING THESE FROM OUR ENGINE. 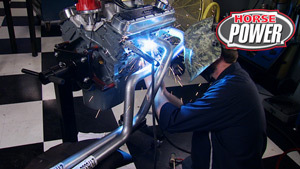 THEY'RE A FORGED IBEAM ROD FROM EAGLE RATED AT 500 HORSEPOWER JUST LIKE OUR CRANK SHAFT. NOW WE'RE GONNA TOP THEM OFF WITH A SET OF SPORTSMAN SERIES FORGED PISTONS FROM PROBE. NOW THEY'RE A FLAT TOP TWO VALVE RELIEF PISTON THAT SHOULD US RIGHT IN THE COMPRESSION RATIO OF 11 TO ONE THAT WE'RE LOOKING FOR. THEY HAVE FLOATING PINS WITH HIGH PERFORMANCE SPIRAL LOCKS, WHICH SIMPLY MEANS THEY WON'T FALL OUT OR GO IN EASY. THE RINGS FROM TOTAL SEAL ARE A PLASMA MOLY ONESIXTEENTHS, ONESIXTEENTHS THREESIXTEENTHS PACKAGE. THEY NEED TO BE FILE FIT. THE OILERS ARE FINE BUT THE SCRAPERS NEED HELP. WE'VE BEEN DYING TO USE THIS RING FILER FROM GOODSON. WITH GAUGE ADJUSTABLE GUIDE, IT TAKES THE GUESS WORK OUT OF HOW MUCH YOU'RE REMOVING. I STILL TAKE A LITTLE BIT AT A TIME BECAUSE YOU CAN'T UNDO WHAT YOU ALREADY DID. THE COMPRESSION RING GETS THE SAME TREATMENT. WITH THE RINGS ON AND OILED, THE CYLINDERS PRELUBED, AND NUMBER ONE IN THE HOLE, WE CAN DEGREE OUR CAM TO THE CAM CARD SPECS, 102 STRAIGHT UP. AND WITH OUR REMAINING PISTONS IN PLACE, WE CAN GO AHEAD AND TORQUE THEM DOWN. ONLY HALF OF OUR TIMING COVER GOES ON NEXT. WE NEED TO FIRST INSTALL THE CAM BUTTON WITHOUT SHIMS, WHICH RIDES AGAINST THE INSIDE OF OUR COVERS. HERE'S WHY WE LIKE THIS SETUP. IT HAS A REMOVABLE PLUG SO THAT YOU CAN ACCURATELY SET YOUR END PLAY WITH THE DIAL GAUGE. BY PUTTING SLIGHT PRESSURE ON A LOBE THROUGH THE LIFTER BORE, I CAN SEE WHERE WE'RE AT. 50 THOUSANDTHS IS A LONG WAY FROM RECOMMENDED 10 THOUSANDTHS. NOW HERE'S HOW EASY IT IS TO CORRECT IT. I USE CALIPERS TO GET A STACK OF SUPPLIED SHIMS RIGHT AT 45 THOUSANDTHS. STACKED THEM BEHIND THE BUTTON AND TRIED IT AGAIN. AND THAT'S WHERE WE NEED TO BE. TO MAKE SURE IT STAYS THAT WAY, I USE LOCTITE ON ALL THE BOLTS AND TORQUED THEM DOWN. THE LAST PART IS THE BELT RETAINER, DO NOT FORGET IT! I'M VERIFYING TOP DEAD CENTER TO INSTALL OUR BALANCER. NOW IT'S A TCI RATTLER WITH AN EXTERNAL BALANCE AND A FLOATING WEIGHT INSIDE. IT'S NOISY, BUT WILL GIVE US THAT EXTRA INSURANCE ON BEARING LIFE AND ABSORB HARMONICS AT HIGH RPM LEVELS. AFTER A THOROUGH CLEANING, WE'RE GONNA REUSE OUR MELING HIGH VOLUME OIL PUMP. THE REAR MAIN GETS A NEW SEAL, THE BLOCK GETS SOME SILICONE, AND A ONE PIECE REUSABLE OIL PAN GASKET FROM FEL PRO. SINCE THE OLD PAN AND PICK UP ARE A PAIR, WITH A LITTLE BLACK PAINT THEY'RE REUNITED. AT THIS POINT OUR SHORT BLOCK IS DONE, BUT WE'RE NOT DONE YET. (JOHN)>> WE'RE BACK ON OUR BUDGET BUILD. NOW WE'VE PICKED UP THE PACE A LITTLE BIT. WE'VE GOT THE SHORT BLOCK DONE AND WE'RE GONNA BE REUSING A SET OF EDELBROCK PERFORMER RPM CYLINDER HEADS THAT WAS ON OUR MOTOR LAST TIME. NOW THEY DIDN'T HAVE A LOT OF RUN TIME ON THEM, SO ALL I HAD TO DO WAS SOME CLEAN UP WORK. THE FIRST THING I DID WAS CC AND MILL THE DECK SURFACE SO I COULD SET THEM WHERE I WANTED THEM. THEN I CLEANED UP THROAT AREA WITH A CARTRIDGE ROLL. AND AS YOU CAN TELL BY THE RED DYE CHEM LEFT OVER, I'VE ALREADY LAPPED IN ALL OUR VALVES. NOW SINCE WE DIDN'T NEED A VALVE JOB, WE PUT OUR MONEY IN THE SPRINGS. WE UPGRADED TO THESE BEE HIVE SPRINGS FROM COMP. NOW THEY TAKE A LITTLE LESS SPRING PRESSURE BUT THEY STAY JUST AS STABLE. OUR SPRING HEIGHT IS CORRECT. THE PROBLEM IS THE SPRING'S GONNA WALK AROUND WHILE WE RUN THE MOTOR. NOW WE'RE GONNA FIX THAT BY RUNNING A LOCATOR. NOW WHEN WE DO THAT, WE'RE GONNA LOSE 50 THOUSANDTHS ON OUR INSTALL HEIGHT. WE'VE GOT A COUPLE OF OPTIONS. YOU CAN MACHINE THE SPRING PAD, DO A VALVE JOB AND SINK THE VALVE, OR YOU CAN BUY A WHOLE NEW SET OF SPRINGS. WE'RE GONNA DO THIS! NOW THIS ONE'S THE STANDARD LOCK THAT I USED TO CHECK OUR INSTALL HEIGHT. SEE HOW HIGH THE LOCK IS? NOW THESE FROM COMP WILL ACTUALLY LOWER THE LOCK BUT RAISE OUR INSTALL HEIGHT 50 THOUSANDTHS. I LIKE TO PUT A LITTLE OIL IN THE GUIDES AS WELL AS SOME GREASE ON THE VALVES THEMSELVES. THAT WAY YOU GUARANTEE THEY'RE LUBED DURING FIRE UP. NOW THESE VALVES ALSO GOT BEAD BLASTED AND PHASED. BUT JUST AS IMPORTANT, I NUMBERED THEM TO INSURE THEY WENT BACK IN THE SAME HOLE THEY WERE LAPPED IN AT. WITH OUR LOCATORS LOCATED, WE CAN INSTALL OUR SEALS, SPRINGS AND RETAINERS, FOLLOWED BY OUR NEW CORRECTED LOCKS. WITH A LITTLE MORE SILICONE, ON GOES OUR MULTI LAYER STEEL HEAD GASKETS FROM COMEDIC. NOW ON THIS BLOCK WE DON'T HAVE BLIND BOLT HOLES, SO A ROUND OF SEALANT IS IN ORDER. THESE GASKETS NEED A COUPLE OF TORQUE STEPS TO COMPRESS ALL THE LAYERS, 40, 55, AND FINALLY 65 FOOT POUNDS. THESE ARE OUR NEW LIFTERS FROM COMP. NOW BECAUSE THIS IS A RACING ENGINE, I WENT WITH A RETRO FIT LIFTER THAT'S HELD TOGETHER WITH A VERTICAL TIE BAR. NOW RACERS HAVE BEEN USING THESE FOR YEARS, AND SOME TIMES IT'S JUST AS WELL TO GO WITH WHAT YOU KNOW IS GONNA WORK GOOD. SINCE WE'RE UPGRADING THE ROCKERS, I'M DOING THE SAME WITH THESE SEVENSIXTEENTHS STUDS FROM ARP. HERE'S SOMETHING I LEARNED FROM AN OLD TIMER A COUPLE OF YEARS AGO. DID YOU SEE THAT? THE GUIDE PLATE MOVES WHEN YOU TORQUE IT. SOMETHING AS SMALL AS THIS CAN PUT YOU BACK IN THE TRAILER FAST. NOW HERE'S HOW YOU FIX IT. ALL IT TAKES IS A SCREW DRIVER AND SOME SLIGHT PRESSURE TO HOLD THE GUIDE PLATE STILL WHILE YOU'RE TORQUING. I PREMEASURED FOR PUSH RODS AT THE MACHINE SHOP. AND SINCE IT'S A RACING APPLICATION, I ORDERED COMP'S HIGH TECH VERSION. THESE STYLE FIVESIXTEENTHS PUSH RODS WILL DO THE JOB. WE ALSO UPGRADED TO THESE NEW ULTRA PRO MAGNUM ROCKER ARMS. THEY HAVE A HARDENED ROLLER TIP, OVER SIZED ROLLER TRUNIONS, AND PRECISION SORTED NEEDLE BEARINGS. NOW THESE ARE ALSO GREAT FOR RACING BECAUSE YOU CAN REBUILD THEM. PLUS COMP BACKS THEM WITH A LIFETIME WARRANTY. I LIKE TO LASH THEM ONE AT A TIME AFTER IT GOES ON. THAT WAY THERE'S NO CHANCE OF ACCIDENTALLY FORGETTING TO LASH ONE. 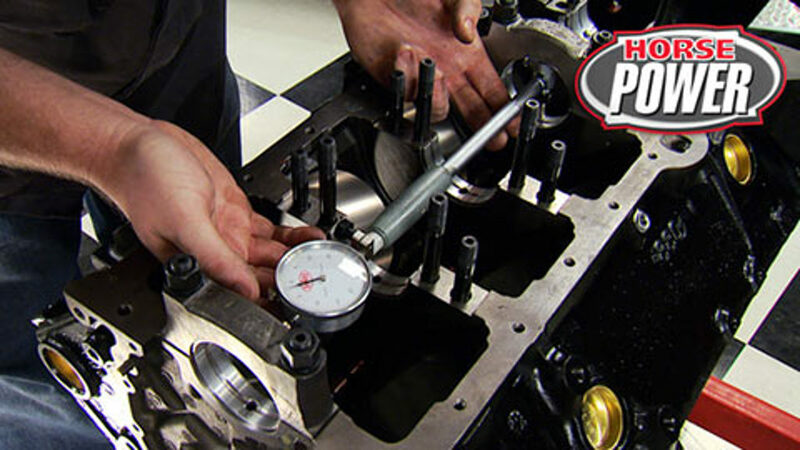 NOW'S A GOOD TIME TO FILL THAT PAN WITH SOME BREAK IN OIL FROM EDELBROCK. IT'S ALSO GOOD FOR ENGINES BEFORE YOU SWITCH TO A SYNTHETIC OIL. I'VE BEEN TOLD I GO A LITTLE OVERBOARD WITH MY SILICONE. I EVEN PUT A LITTLE BIT ON BOTH SIDES OF MY MISTER GASKET. THEN I MAKE MY CATERPILLAR. NOW WE'RE FINALLY READY FOR THE INTAKE, AND WE'RE REUSING THE OLD BUT WITH A DIFFERENCE, WE'VE POWDER COATED IT. NOW IT MAKES NO DIFFERENCE IN THE RACING WORLD. SO WHY DID WE DO IT, BECAUSE WE CAN. NOW THE TRUTH IS, THE POWDER COATING'S NOT JUST FOR LOOKS. RAW ALUMINUM ABSORBS OIL AND A SLICK FINISH LIKE THIS CLEANS UP WITH A LITTLE WINDEX. AND IF YOU LIKE IT, YOU CAN PROBABLY GET IT DONE IN YOUR TOWN FOR AROUND $50 BUCKS. DON'T FORGET TO APPLY SILICONE TO ALL THE BOLTS NOT GOING INTO BLIND HOLES. NOW WE'RE ALSO GONNA REUSE THESE VALVE COVERS, BOLT ON A DYNO DEDICATED ELECTRIC WATER PUMP, AND FINALLY MOVE THE MOTOR OVER TO THE DYNO CART. (JOHN)>> YEAH, I'M READY TO GO. (MIKE)>> SLOW DOWN, WHEN YOU GET THIS WAY WE MAKE MISTAKES. RELAX, IT'LL ALL HAPPEN. 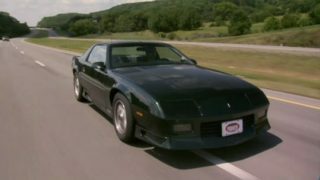 (MIKE)>> IT'S PAYOFF TIME FOR JOHN'S BUDGET BRACKET MOTOR. (JOHN)>> I'M READY TO PRIME RIGHT NOW. (MIKE)>> NOW HE SHOULD BE PROUD. I WATCHED HIM BUILD IT, IT'S SOLID, AND IT'S TIGHT. WHAT WAS THE BORE ON THIS? 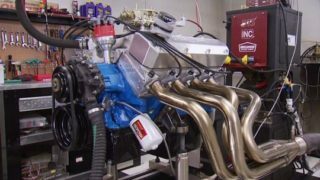 (MIKE)>> BUT WHEN IT COMES TO THE DYNO ROOM, JOHN'S CONFIDENCE THROWS A ROD. (JOHN)>> UH, THREESEVEN, I'M SORRY, THREESEVEN-50. (MIKE)>> HIS TRACK RECORD IS SPOTLESS, BUT HE'S A PERFECTIONIST AND DOESN'T WANT TO LET ANYONE DOWN. GO AHEAD JOHN. AND ME, I'M SICK IN THE HEAD. I KINDA ENJOY THE SHOW! 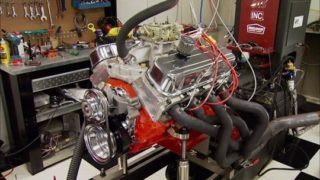 (MIKE)>> NOW THE MSD DISTRIBUTOR AND THE HOLLEY 750 CARB ARE BOTH FROM THE ORIGINAL BUILD OF THE ENGINE. THAT MEANS THEY WERE BOTH TUNED FOR IT AS WELL. LETS SEE HOW CLOSE THEY ARE. HOLD YOUR HANDS UP. YOU'RE NERVOUS AS HELL AIN'T YOU? (JOHN)>> YEAH, OH GOD YEAH! MAN, THIS IS MAKE OR BREAK FOR ME MAN. (MIKE)>> NAH, YOU COMFORTABLE WITH THE WAY YOU WANTED TO GO? (JOHN)>> HELL YEAH, I'M STOKED! IT WENT TOGETHER GOOD. I DON'T KNOW OF ANYTHING ELSE I COULD HAVE DONE IN PREPARATION TO MAKE IT ANY BETTER BUT. (MIKE)>> CHANGED THAT NERVOUSNESS TO CONFIDENCE. (JOHN)>> ALRIGHT, I'M GOOD, THEY ALWAYS RUN PRETTY GOOD. (JOHN)>> I'M AWAKE, THAT'S FOR SURE. (MIKE)>> DESPITE THE CARB SWAP AND THE SMOKE, WE'RE ALMOST THERE, ALMOST. YOU CAN ACTUALLY HEAR THE HESITATION, AND HERE'S WHY. THE SPRINGS ARE HEAVY FOR A SLOW TIMING ADVANCE. SO WE NEED TO SWAP THEM OUT FOR LIGHTER ONES. FINALLY WE CAN BREAK IT IN, BAKE OFF SOME PAINT, AND SEE WHAT JOHN'S EXPECTING. (MIKE)>> YOU CAN TELL BY THE SOUND THIS THING'S STARVING FOR FUEL. WE'LL UP THE JETS AND THE SQUIRTERS. ALRIGHT, LETS SEE WHAT WE'VE GOT. THAT FEELS DEAD ON! 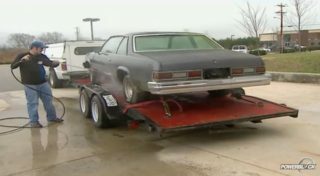 (MIKE)>> 468, 458, IT WANTS MORE AIR, EXACTLY WHAT IT IS. WITH SOME LONGER STUDS AND AN HVH ONE INCH SPACER, THAT'S EXACTLY WHAT IT WILL GET. (JOHN)>> NAH, I'M GOOD NOW. (MIKE)>> MAN THAT THING'S CRISP, IT SOUNDS GOOD. (JOHN)>> IT LIKES TO CLIMB TOO. 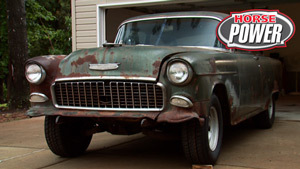 (MIKE)>> 471, 457, THAT TORQUE NUMBER HAS BEEN WITHIN TWO FOOT POUNDS ON EVERY SINGLE PULL. (JOHN)>> YEAH, SINCE WE STARTED. (MIKE)>> EVERY SINGLE PULL. WANT TO SEE IF IT'LL PULL 10,000? (MIKE)>> THERE IT IS, I MEAN THAT'S SOLID. CAN'T DO ANYTHING DIFFERENT. GOOD JOB ON THE FIRST! (MIKE)>> WELL JOHN'S HAPPY, WE ALL GOT ENTERTAINED. (MIKE)>> AND NOW WE HAVE AN EXCUSE TO BUILD A BRACKET CAR, NICE!